Ice cream is one of my guiltiest pleasures. I could eat it every day and there was a time in my life when I pretty much did: When I was fresh out of college and living in Boston I would meet up with my friend Kelly almost every weeknight for a long walk around the city-- exercise and girl talk. By the time we would finish, it would be late and I wouldn't feel particularly inclined to go home and make dinner. So we would stop by J.P. Licks and have ice cream (usually one of their fat free soft serves) for dinner. Because that's what you do when you're 22 and on your own and know better (or you do, but you don't really care). I have to open this post up with my favorite-- and what has become our 'go to' ice cream place. While Scooter's definitely wins for proximity (we live across the street, which is great and also dangerous), I think we would be here just as frequently if we lived further away in the neighborhood because the custard is just so good. Frozen custard is a bit different from traditional ice cream: it includes egg, giving it a thicker and richer consistency than regular ice cream, but not quite as soft as soft serve. 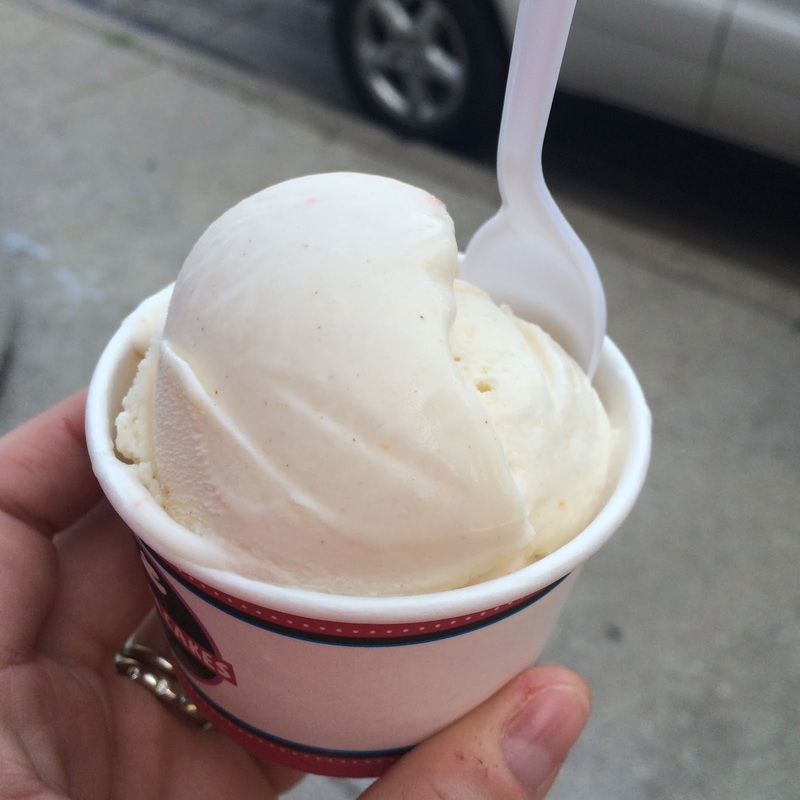 And if you're looking for frozen custard in Chicago, Scooter's is THE place to get it. Scooter's serves chocolate and vanilla custard every day along with a special flavor that changes daily. They have a ton of special flavors and you can usually find me there every time they're serving Nutella, sweet cream, or after dinner mint. They also serve fun themed flavors too-- like pumpkin custard around Halloween and a red and black strawberry Oreo flavor on days when the Blackhawks were competing for the Stanley Cup. Beyond custard alone, they offer are a variety of topping options, concretes (custard blended with a combination of additional ingredients), shakes, and malts. I'm a huge fan of the concretes at Scooter's. The Elvis (with peanut butter cups and banana) is one of their most famous concrete combinations. And the coconut cream pie variety (with coconut and graham cracker blended into vanilla custard) is one of my favorites on the standing menu. They also feature a new flavor combination monthly like chocolate peanut butter pretzel or blueberry pie. Alex's favorite Scooter's item happens to be the Worms & Dirt: a custard sundae with crushed Oreos and gummy worms on the kid's menu. As parents to a puppy, I also love that Scooter's caters to them. Scooter's offers mini cones of vanilla custard especially for dogs and Clery just can't get enough of them. We feel pretty much the same way about the human custards too. And from March through December, you can find us there way too frequently. Black Dog is known for its creative and often savory sweet flavors of handmade gelato. This is definitely a place where ordering plain vanilla would be really tragic since they serve up tons of great flavors like chocolate banana curry, butterscotch bourbon pecan, and cucumber rosewater sorbet. These flavors have gotten Black Dog a ton of well deserved local and national press-- and for good reason. It's never a boring trip to the ice cream shop at Black Dog. We used to take long walks to their original Ukranian Village location when we lived in the West Loop and were so excited when we literally stumbled upon the Black Dog location on Belmont in Roscoe Village. I have visited a handful of times and this is one place where I try not to be a creature of habit. Between the standard menu and the rotating daily specials, there are too many good flavors to try! Some of my favorites have been the Mexican Hot Chocolate (with a really nice kick of spice), Goat Cheese Caramel Cashew (tangy, sweet, nutty, and one of their signature flavors), and the herby Rosemary Irish Cream. I love these interesting flavor combinations and love that they create gelato the way they make it in Italy: fresh ingredients, small batches, and big flavor. While the Ukranian Village location is gelato-focused, in Roscoe Village Black Dog is also serving up coffee, gelato cakes, and a variety of other desserts too. And occasionally Black Dog will partner with local doughnut shop Glazed & Infused for doughnut ice cream sandwiches... do yourself a favor and find one immediately! Bobtail is the most traditional ice cream shop on this list. They don't offer as many bells and whistles as some of the others might, but when we walked up on a warm Wednesday evening and found a line 20 people deep in this little cafe I think that says something. Bobtail is a staple in the Lakeview neighborhood and I first visited years ago when I was working nearby. Now that I'm a resident up here, I'm pleased to report that the ice cream is just as delicious as I remembered. Bobtail's menu is filled with old soda fountain favorites like sundaes, shakes, malts, and floats. They have all of the traditional ice cream flavors along with a few fun ones that are unique to this ice cream shop: Signature Sunset (a combination of dark chocolate and Merlot), Cubby Crunch (vanilla ice cream with sprinkles, Oreos, chocolate chips and toffee), and the Lakeview Barhopper (chocolate whiskey-infused ice cream) are among their signature ice cream flavor combinations. My favorite is their mint chip. 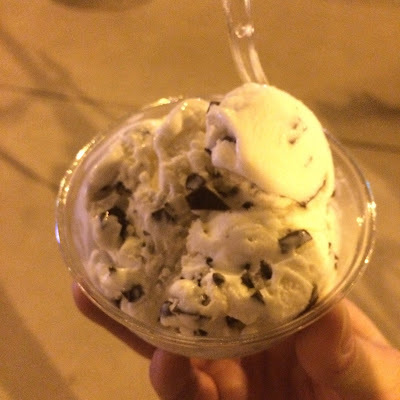 It's not a unique or different flavor, but it's one of my all-time favorites and Bobtail does it right: the ice cream is white (not bright green), creamy, and has a great fresh minty (not fake or overpowering) flavor and is studded with flaky rich chocolate pieces. I love the old fashioned atmosphere and the flavorful homemade ice cream made with high quality ingredients that they serve up at Bobtail. It's a rare find among the more commercialized less authentic businesses you'll find popping up all over the northside. If you're looking for a more authentic gelateria experience with a million different flavor options, look no further than Paciugo. Paciugo was created by an Italian chef looking to bring a taste of Italian gelato to the US. They serve dozens of gelato and sorbet flavors every day-- from traditional Italian flavors like Limoncello and Pistacho to more creative outside the box flavors like Roasted Banana or Blueberry Lavendar to classic American ice cream combos like Chocolate Peanut Butter and Rocky Road. There's a flavor for everyone at Paciugo, no matter what you're in the mood for-- and they all have that wonderful richness of gelato. I had spotted the Paciugo on Roscoe several times while walking through Roscoe Village and had wanted to try it, though we had never made it up there. On our way home from an afternoon at the dog beach though, we stumbled upon a second Paciugo location on N. Broadway in East Lakeview (there's a third up in Lincoln Square) and decided to check it out. I went with a combination of yummy coconut gelato and a super rich dark chocolate flavor. A milk-free dark chocolate gelato was one of my favorite flavors when visiting the gelaterias of Italy and this one really reminded me of those. Alex went classic [American] with a cup of creamy chunky chocolate chip cookie dough gelato. These were just three of so many flavors... can't wait to go back and try more! Smallcakes is new to the Lakeview neighborhood, but this quickly growing franchise is no stranger to many other parts of the country. They're known for their cupcakes (hence the "small" in the name Smallcakes), but some of their locations serve up ice cream too. I'm happy to report that our Lakeview location (on Greenview just south of the Barry/Lincoln intersection) is one of them! Alex and I stopped into Smallcakes recently on one of the few super hot Sundays we have experienced in Chicago this summer. The staff was super friendly and the ice creams all looked amazing. I ultimately decided to order the 24-karat cake ice cream after the woman in front of me raved about how good it was. And she was right! The ice cream was super rich with that nice cream cheese tang, flecks of carrot, and a hint of that cinnamon-nutmeg spiciness. Alex ordered a cup of red velvet ice cream. This also had that wonderful cream cheese tang, a nice richness to the ice cream, and a hearty swirl of red velvet cake pieces throughout the ice cream, which make it taste great and look pretty too. I can't wait to come back here and try the cupcakes too! One confession before I let you go: you are probably wondering why I have left Jeni's Splendid Ice Cream off the menu... Well, I have never been! I have lived near the Southport location for about a year, but they've been closed on and off due to a listeria scare for several of the warmer months of this year. They're on my To Eat list, but I haven't been able to check that one off... yet.